An immature cooper's hawk, Accipiter cooperii. Click to enlarge. 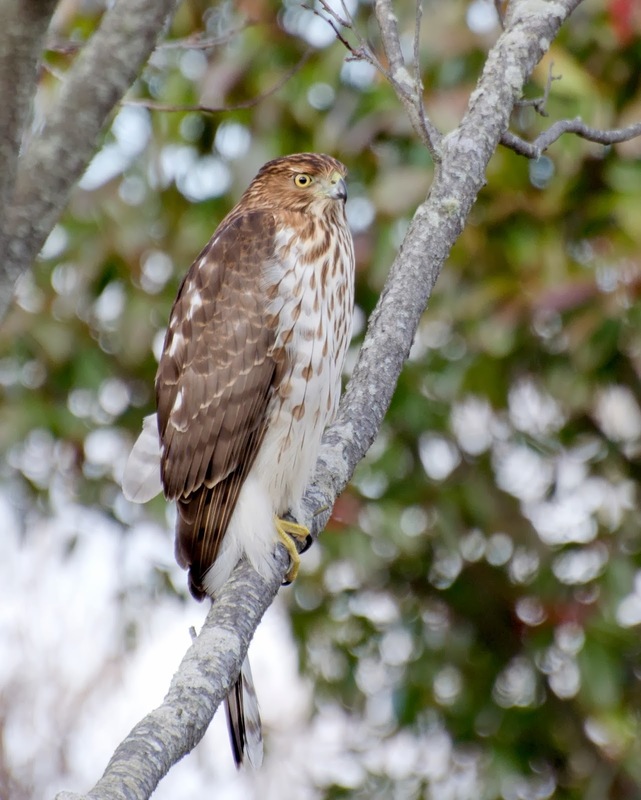 The cooper's hawk is about the size of a crow. Immatures are mottled brown on top with brown-streaked creamy breasts and yellow feet. Adults are slate-gray above with reddish barred light breasts and red eyes. They are found year-round in all but the coldest parts of the lower 48 United States. Birdwatchers call them coopies. The bird in the photo was sitting about six feet from the ground in a tree beside a residential street in Cape May Point, New Jersey, on a Sunday afternoon in January. Cooper's hawks are good fliers, adept at weaving through trees in pursuit of the birds they hunt and kill for food. They are famous for appearing at active bird feeders where they can find prey species. Robins, European starlings, doves and pigeons are among their favorites. They also capture and eat flickers, quail, chickens, pheasants, and grouse. Their diet includes mice, squirrels, chipmunks, rabbits, and bats. Although most people understand that raptors need to eat, few are willing to contribute to the killing or want to see it happen in their yards. So if a cooper's hawk starts hanging around your bird feeder, capturing the birds that come to eat -- stop putting food out for a few days. The birds will stop coming and the hawk will move on. You can resume feeding when the coast is clear. Hello again, your book The Field Guide to Urban Wildlife looks fascinating! I have a niece and her son who live in Brooklyn--he's five. Do you think he is too young to have is Mom share the book with him? Also, just because it's one of my passions, which is to support independent bookstores, Powells.com also carries your book! Maybe do a shout out to them as well?